Kettlebell exercises increase strength, endurance, agility, and balance, challenging both the muscular and cardiovascular systems with dynamic, total body movements. Of Russian origin, a kettlebell is a cast iron weight that looks like a cannonball with a handle attached to it. 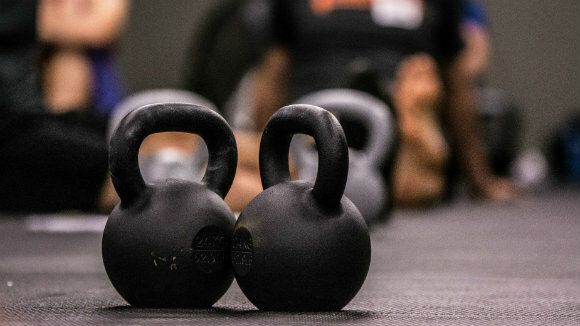 The unique value of kettlebells is derived from ballistic (fast exercise) work, such as snatches, swings, cleans, and jerks. The kettlebell develops all-around fitness and teaches kinetic linking. It gets you connected to the ground, drawing energy from the ground up and transferring the energy through the shoulders. The kettlebell enhances awareness of your posture, position, breath, and grip. I especially like the cardio benefits that kettlebells can provide. It is also easy to perform interval training principles (slow, fast, repeat) with them. 2 - Kettlebell Workouts Burn Calories Fast! A University of Wisconsin, La Crosse Exercise and Health Program study published in ACE FitnessMatters: the average participant burned about 20 calories/min. during the kettlebell workout, which equates to 400 calories during a typical 20 min. workout (that’s equivalent to running a 6-minute mile or cross-country skiing uphill at a fast pace). The rapid calorie-burn is due to the interval training format of kettlebell workouts. Research also emphasized that participants achieved exercise heart rate and maximum oxygen uptake, suggesting that kettlebells provide a more intense workout than standard weight lifting. Since many kettlebell exercises take place with your arms in an overhead position, the muscles responsible for assisting the breathing process are engaged in muscular activity, not allowing them to assist in the respiratory process. This forces the muscles most responsible for breathing to play an even larger role in cardio-vascular fitness. Kettlebell exercises strengthen the glutes and stretches the hip flexors. (In most cases of back pain, hip flexors are tight and glutes are weak). Decreased back extensor endurance is usually associated with chronic back pain. Bracing is considered the standard for core activation because it involves a 360 degree co-contraction of all surrounding core musculature. Below are Dr. Silverman’s recommended Kettlebell exercises.